Martha Wells discussed Raksura culture and gender roles from her books The Cloud Roads and The Serpent Sea. Janice from Janicu’s Book Blog shared some of her favorite female authors who write science fiction with a rundown of what books and series they have available. 2012 Campbell Award finalist Stina Leicht wrote about merging real-world events with fantasy, as she did in her books Of Blood and Honey and And Blue Skies From Pain. Moira J. Moore talked about writing a world without gender imbalance in her Heroes series starting with Resenting the Hero. Jessica from Sci-Fi Fan Letter wrote about expanding your reading experience by getting outside of one’s comfort zone and not judging books based on one thing you don’t think you like. Lisa from Starmetal Oak Reviews recommended four of her favorite SFF books written by women that she thinks deserve more readers. Thanks to all of these week’s guests, who gave us a lot to think about and have added substantially to my already huge wishlist! Fantasy Mistressworks is for reviews of fantasy books written by women that were published before the year 2000. 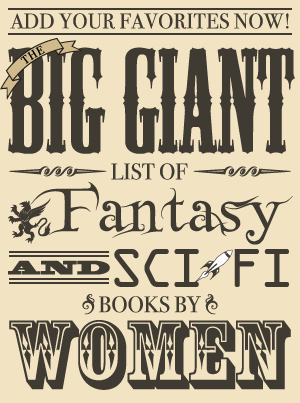 Right now, they are looking for books to add to the list, as well as reviews of fantasy books written by women before the end of the twentieth century. Daughters of Prometheus is for reviews of science fiction written by women in the 21st century (basically, it picks up where SF Mistressworks leaves off – there will be more about this site later this month). They are also looking for reviews of science fiction books by female authors. 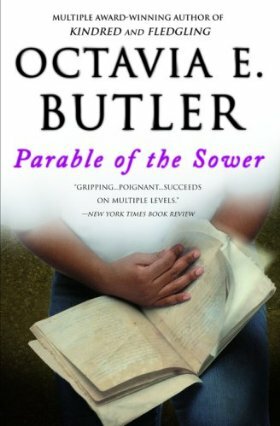 Today I am giving away one copy of Parable of the Sower, a post-apocalyptic science fiction book written by Octavia E. Butler. I enjoyed this one very much for both its thoughtfulness and the main character, a young woman who refuses to live in ignorance of the state of the world around her and shows strength in her struggle to survive in it. Giveaway Rules: To be entered in the giveaway, fill out the form below. One entry per person and a winner will be randomly selected. This giveaway is open internationally, but to be eligible to win, you must live in a country that qualifies for free shipping from The Book Depository. The giveaway will be open until the end of the day on Saturday, April 21. The winner has 24 hours to respond once contacted via email, and if I don’t hear from them by then a new winner will be chosen (who will also have 24 hours to respond until someone gets back to me with a place to send the book). Note: Form has been removed now that the giveaway is over.